To enter issues (or "released") recordings of performances on sessions, use the ISSUES window. An issue can be created before performances are added to sessions, but it is somewhat pointless. No tracks can be placed on an issue until the performances for those tracks are added to a session. Title The title of the issue. The title is optional. Singles, such as 78s and 45s do not have titles and that is ok. When the ISSUES window is not in edit mode, the Title field acts as a lookup field to select an issue for display. Cat. Num. The catalog number for the issue. This field is optional, but is required if the issue has no title. Catalog numbers do not have to be unique, but the title/catalog number combination must be unique. Label The label for the issue. This field is a lookup field. The label entered must have been previously entered in the LABELS window. This field is required. Issue Artist This is a lookup field. The artist entered must have been previously entered in the PERSONNEL window. The artist referred to in this field would be the name used to file the issue. If the issue is a compilation, it can have an artist name such as various. Of course, a "dummy" name such as "various" must be entered using the Personnel window. This field is required. Format The Format popup allows a selection of the format of the issue. This popup can be modified by using Set Popups window. Verification The Verification popup allows a selection of the verification status of the issue. This popup can be modified by using Set Popups window. Issue Date Use this field to enter the release date of the issue. The field is optional, but if used, a valid date must be entered. Circa. Use this to indicate the release date is approximate. Volumes. Enter the number of volumes for the issue. The field will default to 1, but should be changed appropriately for multi-volume sets. Orig. Issue Use to indicate that the issue is the original, or not a reissue. Bootleg Use this to indicate the issue is not an authorized release. Private Issue Use this to indicate that the issue was not under the auspices of an established label. This will handle items such as jam session tapes. Although, an item like this would not have a label, the label field is still required. To handle this, create a "pretend" label to use for these entries. e.g. "private"
On Hand This checkbox was added to the program for discographers that wanted to track items that are in their personnel collection. But obviously, it could also be used to track if items are still in print or available at other places. No Reports If this box is checked, the issue will not appear on any of the generated reports. Issue Filter This lookup field can be used to filter the Issue List by Performer, Leader, or Label depending on the corresponding radio button selected below. Selecting Performer will filter for issues where the artist appears on the issue in any role. Selecting Leader will filter for issues where the artist is the Issue Artist for the issue. Selecting Label will filter for any issue for the label entered. New Issue Use this button to put the window into a mode that will allow adding a new issue. When this button is pressed, all fields will be blanked, and the Edit and Delete buttons will be changed to Save and Cancel respectively. Once the fields are entered, pressing the Save button will commit the new issue to the database. Pressing Cancel will revert the window back to the state it had before New was pressed. No changes will be saved. Edit Issue Use this button to put the window into a mode that will allow modifying an issue. When this button is pressed the Edit and Delete buttons will be changed to Save and Cancel respectively. Once the fields are modified, pressing the Save button will commit the changes to the database. Pressing Cancel will revert the window back to the state it had before Edit was pressed. No changes will be saved. Delete Issue Pressing this button will remove the issue from the database. This action is unrecoverable. The image below shows the Issues window in Edit Mode in order to display fields that only display in that mode. Issue window when new button is pressed. Save New Issue/Save Changes The Edit Issue button is converted to the Save New Issue/Save Changes button when the window is in edit mode. The caption on the Save button will be Save New Issue if the New Issue button was pressed. The caption on the Save button will be Save Changes if the Edit Issue button was pressed. Once the fields are modified, pressing the Save New Issue/Save Changes button will commit the changes to the database. Cancel New/Cancel Updates The Delete Issue button is converted to the Cancel New/Cancel Updates button when the window is in edit mode. The caption on the button is Cancel New when the New Issue button is pressed. The caption on the button is Cancel Updates when the Edit Issue button is pressed Pressing Cancel New/Cancel Updates will revert the window back to the state it had before the New or Edit button was pressed. No changes will be saved. Left arrow near Labels field The Labels field becomes a lookup field when the window is in edit mode. Use this button to navigate to the previous (in alphabetical order) label records. Right arrow near Labels field The Labels field becomes a lookup field when the window is in edit mode. Use this button to navigate to the next (in alphabetical order) label records. Left arrow near Artist field The Artist field becomes a lookup field when the window is in edit mode. Use this button to navigate to the previous (in alphabetical order) artist records. Right arrow near Artist field The Artist field becomes a lookup field when the window is in edit mode. Use this button to navigate to the next (in alphabetical order) artist records. All other buttons are inactive when the window is in edit mode. This section of the window uses the 2 step edit mode. Performance Type in this field to find the title of a performance to add to the issue. Performance is a lookup field and found entries will display in the drop down list underneath the field as characters are typed. Only songs that are used as performances in a session will be displayed for selection. Select from the list when the appropriate entry is found. Add To Issue Select a performance from the list-box at the bottom of the window and press Add to Issue to add the performance to the track list of the issue. 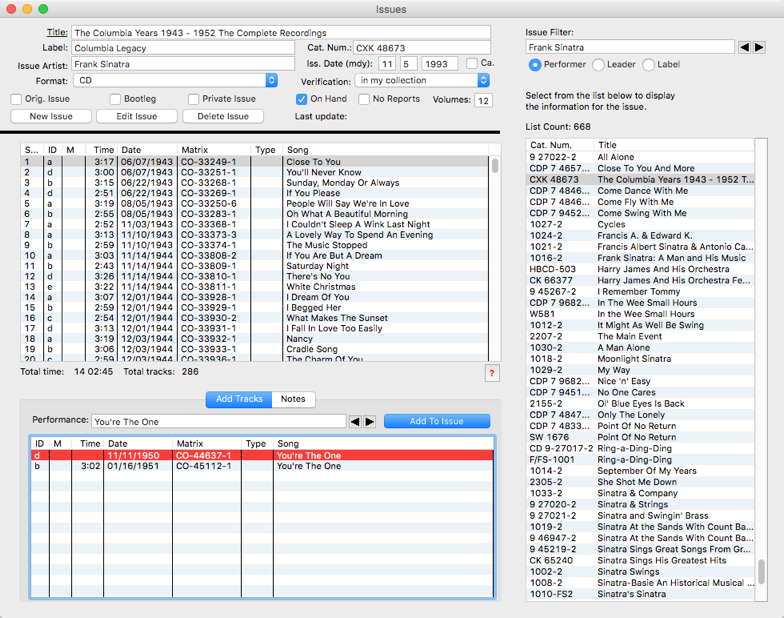 To remove tracks from an issue, select the tracks from the list and press the delete key. Generate any kind of issue list from the List menu. Drag a selected issue from the list to the track list on the Issues window. All the tracks from the entry in the list window will be copied. This feature is especially handy when entering reissues and issues on multiple formats. Display the session containing the performances you want to import in the Sessions window. 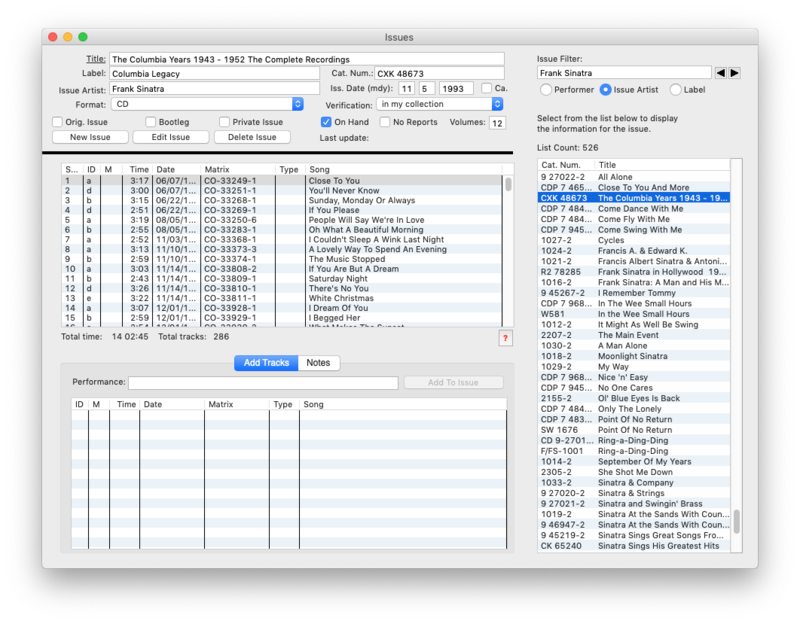 Select the performances from the performance list and drag them onto the track list in the Issues window. Drop the performances on the track list and they will all be entered as tracks for that issue. Using the File->Display->Selected Issue(s) menu, issues selected in the Issue List will be displayed in a new window using the same format as if they were generated via the Reports Window for an Issue Report. Using the File->Display->Sessions for Selected Issues menu, issues selected in the Issue List will have any related session displayed in a new window using the same format as if they were generated via the Reports Window for an Session Report. Use the Lists->Issues->Track List Files menu to create track list files for any issue selected in the Issue List on the Issues window. These track list files can be inserted into a session report for dynamic display on the web page. See the page for Displaying Track Lists in Session Reports for more information.